The Veloce ceramic ring is elegance embodied. A stunning ring of cubic zirconium stones are cradled within a band of faceted, polished black ceramic that glitters exquisitely under any light. The stones are set in sterling silver, the perfect contrast to the midnight depths of the high quality ceramic. This ring is impressively powerful, yet distinctly feminine – this is a piece that by all standards is fit for royalty. 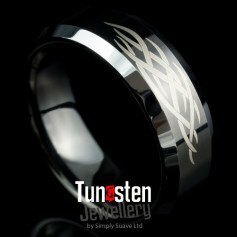 Ceramic band is extremely strong and long lasting, designed to be a ring you will remember for years to come. Makes for an unforgettable keepsake ring. Please note the Veloce is only made to order, and could take 8 weeks for delivery from payment.